� For five straight seasons between 2004-08, Olson set a new career best each year. � Olson earned more money in his 17 events in 2008 than he had in his career up to that point (64 events over eight seasons). 2009: Continued his partnership with Wong, advancing to the semifinals in four of their first six events. The duo played for the title in Manhattan Beach, in what was their only semifinal in the following seven events leading into Cincinnati. 2008: Played with Kevin Wong, and the duo improved in the first events from 13th to ninth to seventh. The duo then played in the semifinals in four of the next five tournaments, including winning in Belmar in Olson's first career victory. Olson concluded the season with a third-place finish in Manhattan Beach with Wong, and he ended as the seventh ranked player on tour. He was second in digs per game (6.61) and eighth in kills per game (6.93). 2007: Began the season with Jason Ring, advancing to his first semifinal in the season opener after knocking off two of the top four seeds. They played in three of the first five semifinals, including the championship match in Hermosa Beach. After five more events without returning to the Final Four, he reunited with Doble for the rest of the year with a best of seventh. Olson was fourth in hitting percentage (.427). 2006: After playing the season opener with Aaron Boss, partnered with Canyon Ceman the remainder of the season, with a best of fifth. 2005: Prior to the season, competed on the Australian National Tour, winning one event. 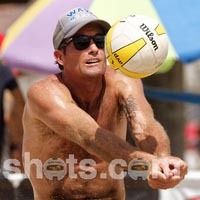 On the AVP, paired with Hans Stolfus for the first seven events, finishing ninth three times. Played four events with Brent Doble, getting a seventh-place finish in their first outing together. Ended the season with one event with Stolfus. Olson was sixth in hitting percentage (.438). 2004: Continued playing with Nichols, and after the pair advanced from the first three qualifiers, were seeded directly into the main draw thereafter. Finished with a best of ninth three times, each time after beating a team with a future beach Olympian; twice defeating Phil Dalhausser and once Sean Rosenthal en route to the ninth place finishes. 2003: Played one qualifier with Hall and then one event with Jim Nichols, advancing through the qualifier and finishing 17th. 2002: Began a partnership with Jeff Hall, getting a pair of 25ths in their four events together. 2001: Played four events with Burke, including two main draws, and had a best of 17th. 2000: Olson began his pro beach volleyball career with a pair of events with Sean Burke, but did not emerge from either qualifier. Hot Winter Nights: Olson played in three Hot Winter Night events in 2009, placing second twice. College: Received a BS in Physical Education from the University of Arizona, where he helped the club team to a national championship in two of the three years he competed. Personal: Matt and wife Lindsey met while playing club ball at Arizona. Lindsey is a high school biology teacher and plays volleyball as much as she can. In addition to being beach volleyball enthusiasts Matt and Lindsey are avid surfers. Younger brother Trevor and wife Heather are also Arizona volleyball alums and play beach ball with their sons Tegan and Ryder. Parents Dave and Susan still play beach volleyball and his father plays a couple days a week at Moonlight Beach in San Diego. Matt represents: The Big Biz Show, Oakley, Matsa, JUMP, Libafit, Wave Volleyball as well as Fairfield and Nichols Properties.